Roti is a flatbread that is traditionally served in India and some Caribbean countries. The bread is an accompaniment to curries and is used to dip into the sauce and to clean the plate. There is no leavening in this recipe. It is quickly cooked on a hot skillet and is best served warm right off the heat. 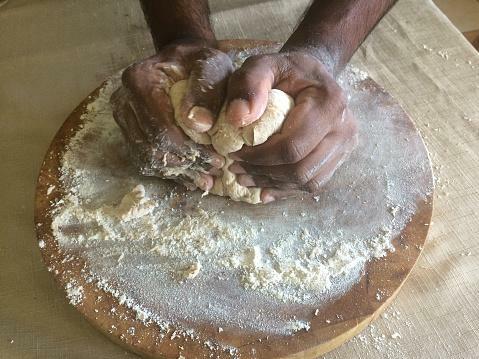 While roti is usually made with all whole wheat flour, a little all purpose flour adds some strength to the dough. Combine the two types of flour in a large bowl and stir in the salt. Gradually add the warm water, stirring until a soft dough is formed. Knead the dough for 2 minutes. Cover the dough and let stand for 30 minutes so the dough relaxes. Roll the dough out onto a lightly floured surface and brush with some of the ghee. 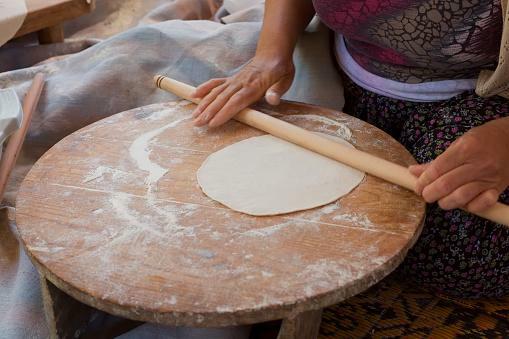 Fold the dough into thirds, brushing with more ghee as you make each fold, and roll out again. Gather into a ball. Divide the dough into 12 pieces and roll each piece into a circle. Now heat a large skillet or cast iron pan over medium heat. When a drop of water sizzles on the skillet, add the roti. The dough will start to rise a bit and form bubbles. Let the bread cook for 2 to 4 minutes until golden brown spots form, then turn with a large spatula and cook until golden brown spots form on the other side. Let the roti cool on a wire rack. Cover with a towel to prevent dryness. You can make your roti without the ghee. Just roll out the dough pieces and cook them on the skillet. Serve roti with any curry or soup or stew. It's delicious dipped into the sauce or liquid. The roti can be spread with butter or ghee before serving. 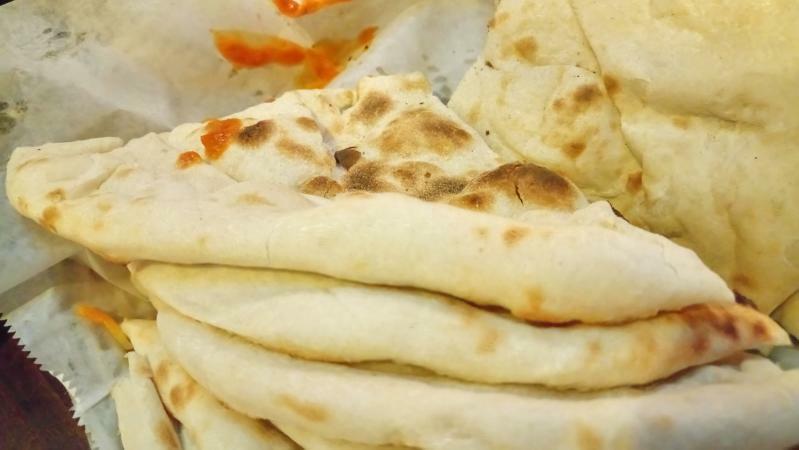 Roti and chapati are basically the same recipe; the bread is called roti in northern India, while it is called Chapati in the western and southern parts of the country. The best roti is made with ghee, which is clarified butter. To clarify butter, slowly melt and cook it over low heat. The foam on top will disappear, and the milk solids in the butter drop to the bottom of the pan. The ghee is then carefully poured out of the pan, making sure that the milk solids are left behind. Ghee is great for sauteing and browning foods, as it will not burn as quickly as butter will. Roti is traditionally cooked on a tawa, which is a flat cast iron skillet. If you have one you can use that, but the bread can be cooked on any hot metal pan. In some traditional households, the roti is cooked on the sides of a clay tandoori oven. Now that you know how to make roti, you can enjoy it anytime. This quick bread is easy to make and is a great accompaniment to any meal.